The activity of any organization is more or less branchy network of processes. The description of these processes is a hard technical task which requires definite methodology and standards. For the first time this problem arose in the seventies of the past century during the development of complicated projects requested by the Air Forces of the USA. ICAM system (Integrated Computer-Aided Manufacturing) was developed and later on its basis there was developed the standard of structural description of IDEF0 processes. In 1993 the government of the USA accepted this standard as a federal standard. In 2000 the new version of ISO 9000:2000 standards was accepted by International Organization of Standardization. The main idea of this standard is a representation of organization activity as a network of processes hence the management of organization is the management of this network of processes. It is for description of these networks the IDEF0 standard is used. According to the IDEF0 standard any process can be described in the form of a block (Activity Box) which has inputs and outputs. The process consists in transformation of inputs into outputs under the influence of the management and in the presence of necessary resources. Outputs of the given process later on can be either inputs for the next process or resources, or management means. Besides, each block on the diagram has its unique identification number. For instance, the optimization process of the initial code of the program product can be represented in the form of the following block in which already existing quick-and-dirty code is the input, technical task on modernization is the element of the process management, programmer and hardware are the modernization mechanism and at the output optimized code will result. On the diagram an interaction between processes is presented by way of arrows, which connect outputs of one processes with inputs of others. Actually the diagram consists of only 2 elements: blocks-processes and arrows which connect them. Depending on their position on the diagram arrows are classified into input and output arrows, arrows of mechanisms (resources) and management arrows. Besides, arrows can be distinguished by any other criteria. By prior agreement, for more pictorial presentation of consecution of processes, arrows can be marked out with color or with other line types (E.g. solid or dotted, thin or thick.) Various types of lines are used not only for obviousness like at presentations, for example. Also, using different arrow types it is possible to process the diagram of processes by means of computer programs and to get reports, which characterize the definite type of industrial process. At composing the diagram of industrial processes the principal of decomposition is used, i.e. the complicated process is divided into small parts. The degree of the detailed elaboration is defined by the diagram developer. For instance, code optimizing process can be divided into constituents such as the optimization itself, results testing, bugs fixing, second testing and documenting of the new optimized code. 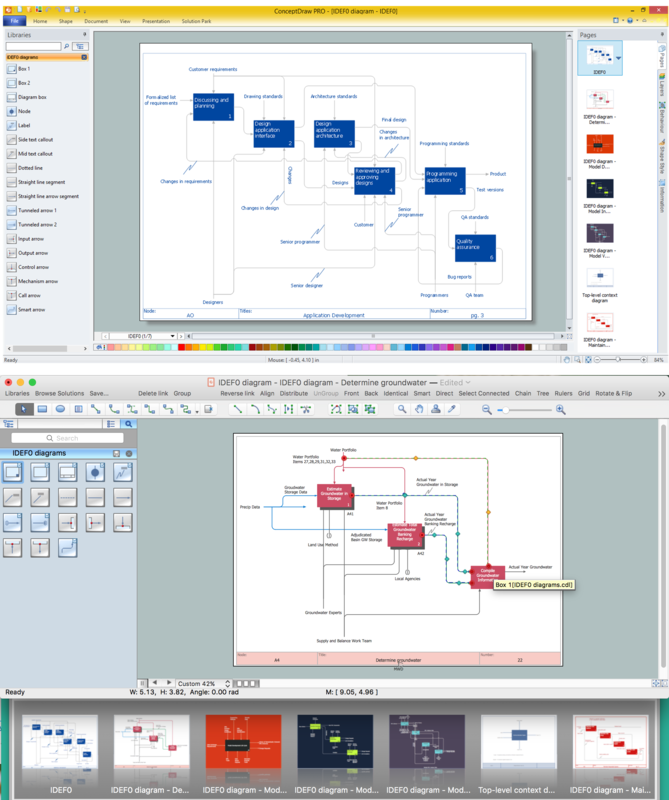 According to IDEF0 standard the process of diagram composing starts from presentation of the whole system as one block with a unique number A0. Besides the purpose of the diagram with the viewpoint in the form of the brief description are denoted. The definition of the diagram purpose allows choosing of processes which should be denoted and described on the given diagram, and the viewpoint defines the degree of the necessary detailed elaboration of these processes. The diagram on which not detailed initial processes are represented is called a Parent diagram. The diagram of the detailed process from the Parent diagram is called a Child diagram. Correspondingly, the block which is worked out in detail in the Child diagram is the Parent Box, and all blocks which describe it in the Child diagram are Child Boxes. Blocks numbers on the child diagrams begin with the number of the parent box. For example, if the parent box has number À15 then child boxes will have numbers À151, À152 and so on. Accordingly to IDEF0 standard for description of notations and expressions used in the diagram, a glossary is used. For example, the notation of the computer Mac1 which is used as a mechanism may contain the description of computer parameters.